My right knee is pretty sore. I really should have stretched before starting to inline skate, but such is the way with a 49 year old that thinks he is 19 years old! The bottom line is that I am thankful I have nothing more than a stretched (strained) ligament in my knee and though it is quite sore, I will recover. I have learned that our Father is a bit more tender than the pavement in stretching us and generally, He is quite patient if we will work with Him and allow Him to stretch us. 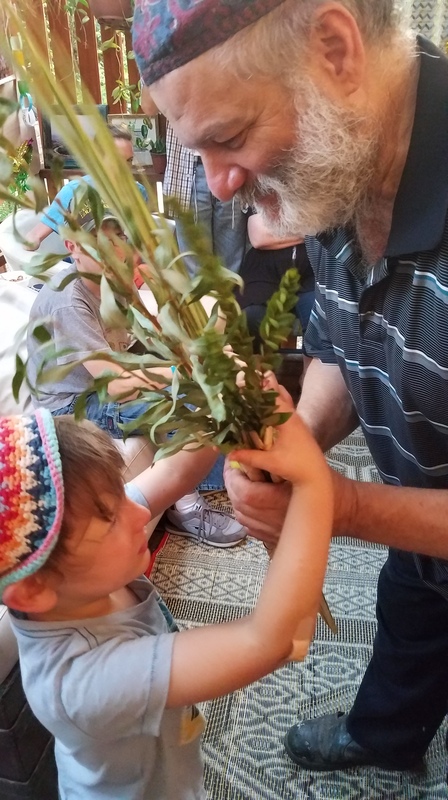 My family and I began this Hebraic/Messianic walk about five years ago and it has been a process of stretching and recovering from each successive step that our Father has led us through. Each step has taken us out of this box or that box, shifting our paradigms and helping us to learn and grow and understand Him and His Word more. Some steps have been HUGE. The first six to eight months of this journey was like wrapping my mouth on a firehose. My head almost exploded! But, graciously, after each new step, Father gives us periods of time wherein we can recover and process and adjust to our new paradigm before He leads us farther forward. The past five weeks or so have been one stretching paradigm-shifting event after another. We had been in a somewhat relaxed/recovery phase before our recent trip to Israel, but He shook us up good on this trip and so stretched us that it has been much like those early days drinking from a fire hose. I am still processing so much. One of the really cool paradigms that shifted on this trip was my understanding of Judah and his relationship with YHVH. On our first trip to Israel last year, Hanoch Young, our excellent tour guide for a couple days, took us to the Shorashim Shop in the Old City so we could hear from Moshe Kempinski, Orthodox Jew, who recognizes what is happening with this great Torah awakening among non-Jews. As I sat and listened to Moshe, I heard his heart and in the hour or so we were in his shop, I could see the fruit of the Spirit all over him. Here was a man that exposed falsehood in either what I had been taught, or what I had understood from what I had been taught. In Christendom, the continual anti-Semitic undertone, and the ‘new’ Testament-centric theology would imply, if not say overtly, that Judah did not and could not have the Spirit. Never mind that we could see clearly that there are many Spirit-filled saints all through the ‘old’ Testament. The implication was always that that changed at the cross. Somewhere in the back of my head I think I knew that was wrong, but I had never been face-to-face with a living example that shattered the false paradigm. Then, there I was with leaky eyeballs listening to Moshe and seeing someone who does not know the Messiah as I do, but clearly walked in the gifts and fruits of the Spirit. I came home with this nagging struggle in my head that needed solving. As we set out on this trip to Israel, we prayed individually as well as corporately for ‘Divine appointments’ wherein we could interact with Judah and get to know our brother. As I have written in many recent posts, Abba answered ‘in spades.’ We had so many incredible interactions and spent quality time with so many different brothers that I came away with numerous additional examples to lay beside Moshe. Not only was he not an anomaly, but I found his fruit among many of the Orthodox. I spent hours with Eliyahu, a man with a tender heart and infectious laugh who is watching with his whole heart for the Geulah, the Redemption, and the coming of the Moshiach. I stood in the Shorashim Shop and spoke with Dov Kempinski and could feel and see the same Spirit that was clearly with Moshe a year ago. I had multiple interactions with our host’s father, David ben Aharon, and though he spoke very little English, his personality and mannerisms exuded the Presence. I’ll never forget him drawing us forward in their synagogue on Simchat Torah and he throwing his personal tallit over my shoulders and guiding me to a Torah scroll to walk with in the celebration. He returned to me near the end, again giving me his tallit, and motioned for me to take a particular scroll to the ark for storing, an honor not quickly bestowed. 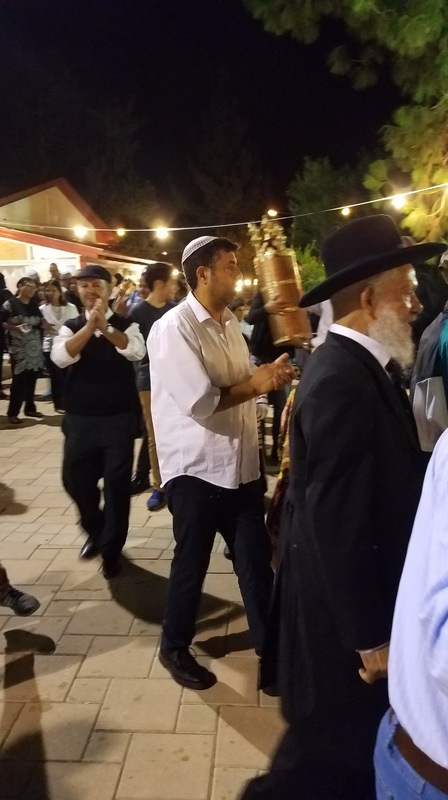 There were numerous others, but perhaps the single most impactful was the evening of Simchat Torah as we joined the celebration outside of the Synagogue in Gi’vat Ye’arim. Men were singing and dancing and walking scrolls and though several stood out with the aura from being in deep worship and filled with the joy that only comes from the Lord, there was one in particular. I did not get to speak with him, but I watched him for the two or three hours we were in their midst. Even now I can see the joy and peace as he danced. At a couple points I was drawn to dance next to him and hold his hand as we circled the table with the scrolls. The fragrance of the Messiah was all over him!! No, I don’t think any of these men know Yeshua as we do and would certainly not articulate their faith with the ‘Christaneze’ terms we would use, but every one of them exuded the Spirit in a way that few do. They each showed me Light that removed the darkness of false understanding from my soul. Now, I know truth: There are absolutely many Spirit-filled Orthodox Jews. They may reject the ‘Jesus’ of Christendom because of the falsehood attached to that name and the horrors done in it, but they are most certainly looking forward to the coming of the Messiah and they walk by faith and keep His commandments. This whole discussion impresses me further with the clear understanding that instead of talking about Judah and what we think they do or don’t believe, maybe we should be talking to Judah and getting to know them and their hearts, then we can have the right to have discussions about what we and they believe. Most will be surprised to find that we are amazingly close on a significant number of points. What connects us is far greater than what separates us. Again, my paradigm has been shifted. This entry was posted in A Thought... and tagged dialog, freedom, Orthodox Jew, out of the box, paradigm shift, Spirit filled. Bookmark the permalink. 14 Responses to Spirit-filled Orthodox Jews? Paradigm-shifting. Coming from a charismatic background now that I have stripped my former theology down I have to light when Christendom and even Hr thinks it has the corner on being spirit filled. Especially after one reads Judges-nothing in the NT that is not there in the OT. If it is ‘new’ then we better check if it is in the original-bc we may be practicing something differently than originally intended. Steve Berkson-a Jew raised in Hebrew school-does the best breakdown of that former thought system I had. Helped me understand how off/biased my former thoughts were. Even the Talmud speaks of the Holy Spirit which many would dare consider exists as a thought to a Jew. But honestly Judges is just loaded with it-great for a word study. Acts Laying on of hands, handkerchief and shadows doing amazing things-try Elijah/Elisha and laying body tp body, cloaks and bones ressurecting! I think you give me more credit than is due, however I do feel that anyone who takes an objective look at what is happening in the world today can see unprecedented events that are leading us to geula. Pete, what an exciting and humbling time in which we live! God is at work in such amazing ways, that to close one’s eyes to it, is to deny truth. I, too, have been brought to new and deeper understandings of what our brothers have to teach us and there is no place for any arrogance or pride – only humility. I do hope you purchased Mosheh’s books because as I read them, slowly, I am dumbfounded by the insights which we never seem to have really understood. Through a man in Uganda (orthodox), I am now in dialogue with an orthodox man in Jerusalem on issues of faith and look forward to our deepening friendship and what God is wanting to teach. Yeshua is the Living Torah. Orthodox Jews have spiritual Torah (Rom 7:14) without the physical “Jesus” (yet still in full anticipation of Moshiach). Christians have the physical ‘Jesus’ without the spiritual Torah. Each portion of the Body is lacking. May Abba lift the veil from each side! Exactly. We are all going to be corrected. None of us has it all right. Therefore, humility and grace with expectancy. So great to come to this realization, eh? My first (tentative) grasp of this came about eight years ago when I purchased some CDs by Sam Glaser at a Jewish shop in Denver (it wascalled “Mile Chai”). As I listened to his music, I could sense his deep, intimate relationship with HaShem. And his lyrics come right and say things I thought, previously, were somehow reserved for ‘christians’ – things like “fill us with your Spirit” and “I long to be in Your Presence.” You should check him out: http://samglaser.com/ Order his music, and subscribe to his blog. Thanks for the recommendation! Will do! Brutha!!! How are ya? Was hoping to see you in Israel, sorry it didn’t work out. Praying blessings on you! Headed over early next year. Me an two other guys who are paleontology, archeology, antediluvian researchers. A 4th guy joining us in the middle of the trip will be coming off a fresh dig at Qumran. Might want to pick your brain on staying with some locals. We’re hoping to go indigenous as much as possible while we traverse the whole county. Of course we would happily pay them shekels for the trouble. Also, I’d love to spend one of our Shabbats there with any of the folks you talked about in your blog. Trying to give my traveling partners some exposure to 2 house ideas while in Israel. I will probably email you for further discussion and specifics.